After a couple of uncreative months, I decided to put books on the backburner and focus on some fun creative projects during the month of March. As a result, I have only read one book this month. Shock horror! I'm currently staying with my Grandma in the South East so I'm indulging in lots of food, tea time quiz shows and itv3. It's truly glorious! Although, I'm definitely looking forward to getting home, being bookish and hanging out with my family properly. Let me know what you're currently reading in the comments below and I'll have a gander. I won't share a synopsis because it's the third book in the trilogy so I don't want to give away SPOILERS! Patrick Ness is the king of YA, in my humble opinion. I consumed the Chaos Walking trilogy like no man's business even though I'm not a seasoned reader of YA literature. I thought The Knife of Never Letting Go was absolutely fantastic and I pretty much sailed through The Ask and the Answer so I had high expectations for the final book. Despite being a meaty tome, Monsters of Men had me hooked. It was so nice to return to New Prentisstown, albeit a little bittersweet because I really didn't want this series to end! Ness has a serious talent when it comes to writing complex characters and creating flawless pacing! I also really enjoyed the addition of the third perspective, which was both refreshing and horrifying because it was pretty much used to illustrate the horrific realities of war. I was seriously satisfied with this book. I put it down and sat very quietly for about half an hour because there was so much to process. I miss all of the characters already, it's a little ridiculous! And yes, Patrick made me cry yet again. If you like action-packed YA adventures, you should definitely read this series. Ness at his best...well alongside A Monster Calls, of course, because that's beautiful too! Well I'm currently reading Wild by Chery Strayed, its a hiking memoir, but its not really about hiking. She's a recovering drug addict, recently divorced and still grieving for the loss of her mum. She decides to quit her job and use all her money to hike the pct trail, having no hiking experience whatsoever, wearing boots a size to small and carrying a rucksack full of books to accompany her. I'm surprised by how good it is, its the best thing I've read this year, and not the type of thing I would usually read. I read the knife of letting go, I did like it, but don't know whether i want to commit to the whole trilogy. I do want to know what happens next though, the first book has a hell of a cliffhanger! So this is definitely one that's been added to my "to read" list! The past year I sadly didn't read as much as I wanted to so I'm really starting to make an effort to read more books this year (I used to read them nonstop and I want to get back to that). I've decided to start a "Books of the Month" Feature on my blog inspired by your book centered posts. I think I'll also start writing down what books I want to read that month. Anyways, thanks for bringing this book to my attention! 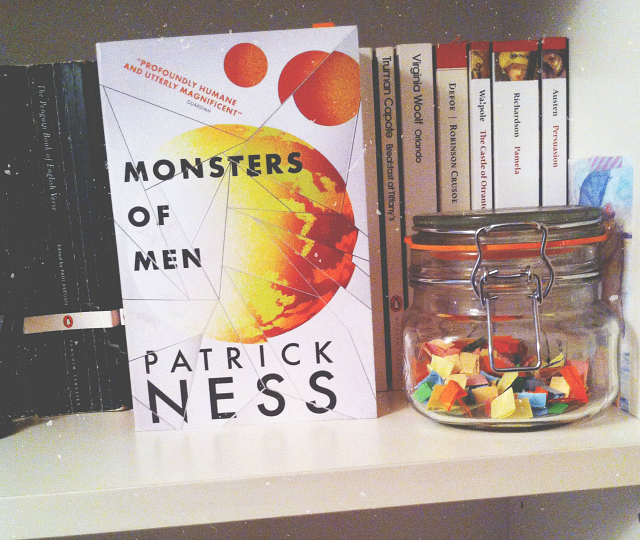 I haven't read any of Patrick Ness' novels but I've heard really good things so I'll have to add them to my TBR! I'm just finishing The Detour by Gerbrand Bakker at the moment which I'm really enjoying. i ordered this trilogy recently from the book depository and am just patiently waiting, ahh it sounds so great!! I just finished "The Night Circus" which was actually pretty cool, i miss all the tents and the circus food! and now i'm currently reading Submarine, i'm about half way through. I picked it up based on your review on it and it is absolutely hysterical!! Oliver's perspective is just so unique and funny i love it! Ah that sounds so good, it's definitely been added to the 'to read' pile. I will never stop loving YA, such a fun genre. I'm reading the Harper Connelly series by Charlaine Harris. It's weird reading a book from the perspective of someone who is basically a psychic since I really don't buy into any of that stuff in real life, but crime novels are just too fun. I am for sure trying this trilogy. I have heard SO MUCH about it that I simply can resist no longer, I gotta get me a piece of the action. Plus, whats better than a brand new book?.. A trilogy of brand new books!! Woohoo!! Well if you're only going to read one book a month then it should definitely be as good as this one is. Patrick Ness's writing is just perfect. Have you read More Than This yet? It's absolutely amazing!